(1) I recently had a conversation with a professor of Anthropology who contradicted me when I remarked that the variations between Northern "Tai" writing systems were quite easy to cope with reading. He contradicted this simply by complaining that, from his perspective, the differences between these scripts were extremely difficult, and he named some examples he had encountered, in moving from one contemporary dialect to another. 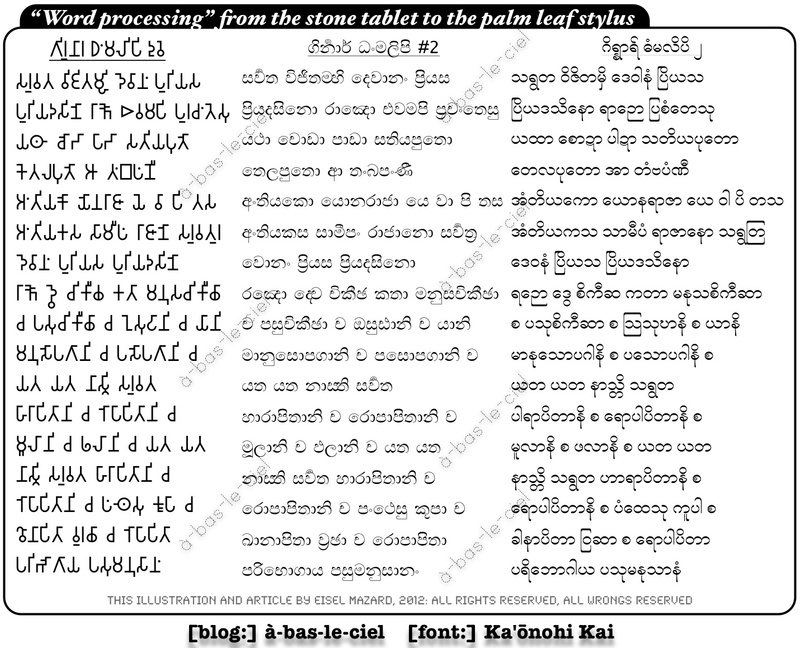 My perspective on these writing systems starts with the edicts of Aśoka (Ashoka), and continues through Pallava, Mon, Old Khmer ("Cambodian"), various Burmese variants (including Lanna) and and so on; I tend to be aware both of how these writing systems were applied to Pali and to the corresponding vernacular languages; and then, of course, I have some experience with modern Lao (I lived in Laos for two-and-a-half years, and bartered for my groceries in the language during those days). Given my own peculiar mix of prior research (into both the ancient and the modern) the written language is the easiest aspect for me to cope with, in all of these contexts; however, I do understand why it is that the written aspect is the most difficult for so many others. Not many people start with Pali; not many people end with Pali; and even amongst those who can read Pali, few to zero start with the most ancient writing to then "work forward" and learn the more contemporary systems. The pedagogical value of learning to read the inscriptions of Aśoka for yourself (in their original scratchy lines) should be obvious to everyone working in a wide array of languages (living and dead), at least spanning from from India to Cambodia, with Sri Lanka, Burma and Thailand in-between. (2) In addition to the enduring "propaganda value" of the Aśokan inscriptions themselves, there are rarely-mentioned Mauryan dynasty inscriptions scattered all over Sri Lanka. 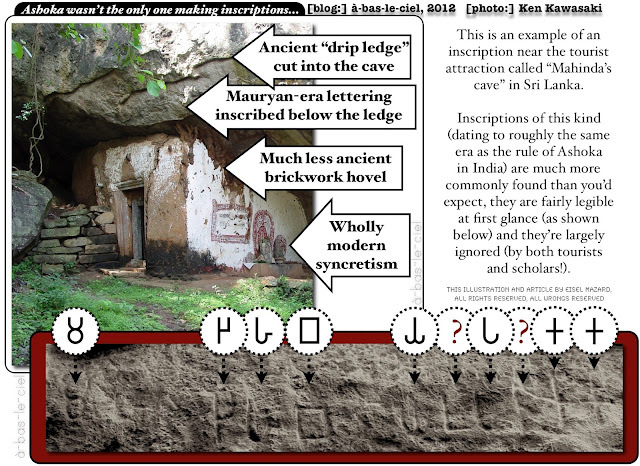 The script is most typically seen on the "drip ledges" of caves (surrounding many of the ancient sites that are now modern tourist attractions on the island); these were natural caves that underwent "renovation" for monks to inhabit; the stone of the cave floor, for instance, has sometimes been flattened to make a better "bed", and the purpose of cutting along the drip-ledge was to direct rainfall away from the entrance and, thus, prevent flooding. I've managed to put together an illustration of this at the top of the article (and, for the record, I was standing next to Ken when he took the photograph, pointing at the inscription with some excitement). The segment of the text that is "zoomed in" (in black-and-white) is neither the start nor the end of the extant text at this particular cave; the excerpt starts and stops where it does simply because this shows a relatively flat stretch of the stone. Naturally, the surface is neither straight nor flat, but follows the curvature of the exterior of the cave. The proper method of transcribing these inscriptions normally requires "taking a rubbing" letter by letter (i.e., recording an impression by laying paper directly on the surface and then rubbing a crayon over the paper). However, with minimal effort, you're here able to identify most of the letters at a glance. For anyone who can recognize the ancient method of writing, these inscriptions make a powerful impression when wandering the island; they make the very remote past seem tangible in Sri Lanka, perhaps moreso than the monuments of greater scale. However, the inscriptions of this era (in Sri Lanka) rarely say anything more than the name of the donor (who paid for the renovation of the cave, presumably); sometimes the donor's profession and village-of-origin are added, and sometimes the reader may be unable to guess if they are looking at the name of a person, profession or village, but can see that it is a name in any case (and not a philosophical statement). There have been some archaeological surveys trying to collect together this evidence; every one that I've read myself opens and concludes with bitter complaints about how little progress (of this kind) has been made in the last century in Sri Lanka. Although this stuff seems self-evidently inspiring, very few people get inspired by it. (3) While every possible publication (including the newspapers of India and Thailand) continues to broadcast propaganda claims built on (dubious) claims about what the ancient inscriptions of this era say, it seems that almost nobody alive has any interest in reading them for themselves (and I've learned this the hard way, over the last ten years). 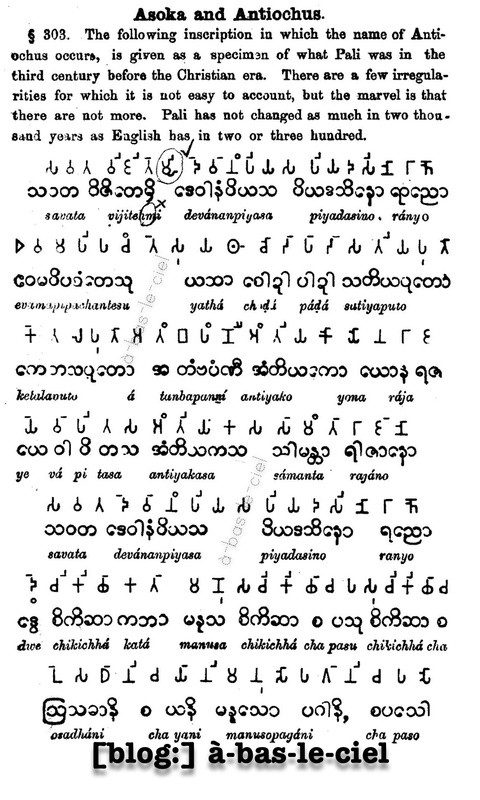 One of the few historical figures who did take a positive interest in this ancient script as pedagogy was the Christian missionary Francis Mason (who was primarily famous for his work in Burma, and whom I already mentioned with some castigation in a prior blog on Cree syllabics). The Aśokan-era script is remarkably easy to write (by hand) but, as you can see in the illustrations here, Mason was one of remarkably few people to attempt typesetting and publishing it. Given the intellectual accomplishments of Christian missionaries of this kind, it's a bit embarrassing how few Western Buddhists ever bothered to learn modern Burmese-script Pali, let alone the various precursors in the history of South and South-East Asia. 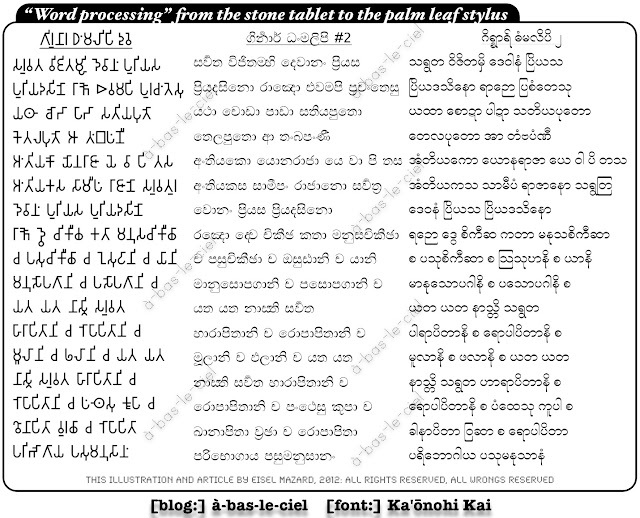 As you can see here, Mason set out both the Aśokan script and the Burmese in (imperfect) parallel, almost as a diversion in the course of his textbook on Pali language and grammar. Why is the parallel imperfect? Well, one of the simple facts that should leap out at you from these illustrations is that the language of the edicts of Aśoka is neither Pali nor Sanskrit (although much of the propaganda dogmatically insists the contrary, and you may meet people who verbally insist on one or the other, on the basis of secondary sources); thus, we do get a few character combinations that neither literary Sinhalese nor Burmese-Pali are accustomed to expressing orthographically in these (multi-directional) transcriptions. 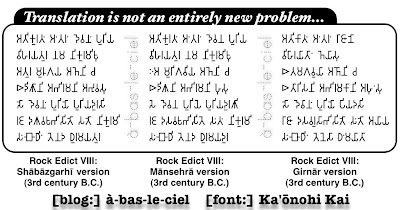 (4) The most ancient script shown here (that has endured so well on rough stone surfaces) has proven more difficult to adapt to typesetting --and almost impossible to express through computerized word-processing. Something similar could be said about the peculiar difficulty of getting literary Sinhalese and Burmese onto a computer screen (just a few readers looking at these illustrations will know enough to gasp at the difficulty of this: all these illustrations were typeset in Unicode… unlike Mason's hand-made press). This brings me to the peculiar case of Ka'ōnohi Kai, without whom none of these fonts would exist, and without whose work all of these illustrations would be impossible. I corresponded with Ka'ōnohi over a period of many years: there were several periods during which I wrote to him daily, sending in detailed error-reports, and suggestions for improvement, when the fonts were under development. My correspondence with Ka'ōnohi often dealt with minute questions of how exactly two glyphs should combine, or how a certain curl-of-the-pen in a character wasn't quite the right shape. I described all of this verbally as I actually had no access to a scanner in those years. I was sometimes sending in these reports from monasteries in Sri Lanka, and, at other times, from a garret in Vientiane, and so on. Through a thousand tiny revisions, I became involved with the making of these typefaces; but all of the hard work was done by Ka'ōnohi himself, in Hawaii. We never met in person, and I knew that it would be impossible for us to ever do so after he renounced his American citizenship in support of Hawaii's native sovereignty. I now haven't heard from him in several years, and I haven't found any recent updates from him posted on the internet; my thanks now goes out to him without expecting to hear anything back. I was hoping to hear more from him after I switched from Southeast Asian languages to working on a language indigenous to "the new world" (scil. the Algonquian language Cree) but he seems to have disappeared. At some point in this long correspondence, Ka'ōnohi must have lost his objectivity because I convinced him, against his best interests, of the philological and pedagogical value of creating a font that could properly display the Aśokan-era inscriptions. With the full awareness that this product would have a total market of roughly ten scholars, Ka'ōnohi undertook the long hours of labor to make this possible, simply as a favor to me (or, perhaps, to reward whatever efforts he thought I had made in obsessing over revisions to so many other fonts, from modern Lao to medieval Khom). The results remained imperfect for a rather sad reason, beyond anyone's control: the technical support from Mac was wildly inconsistent from one version of the operating system to the next. During those years, Ka'ōnohi would scramble to "fix" all of his fonts every time Mac updated their software --although there had been nothing broken about them before. This was exasperating to people all over the world: around the year 2001, Mac had an enormous advantage over Windows in rendering the languages of the poor (just ask anyone who was typing in Tibetan in the 1990s; the difference was even more dramatic for languages that had zero commercial incentive for software developers in that era, like Khmer and Shan); however, in the space of just a few years of corporate indifference, this advantage was eroded, along with the patience of many people who had come to rely on Mac. Despite the uniformity that the Unicode standard was supposed to create, many people found that they had to re-type documents on their hard drives that had become incoherent (in updating from one version of O.S. 10 to the next) through no fault of their own. 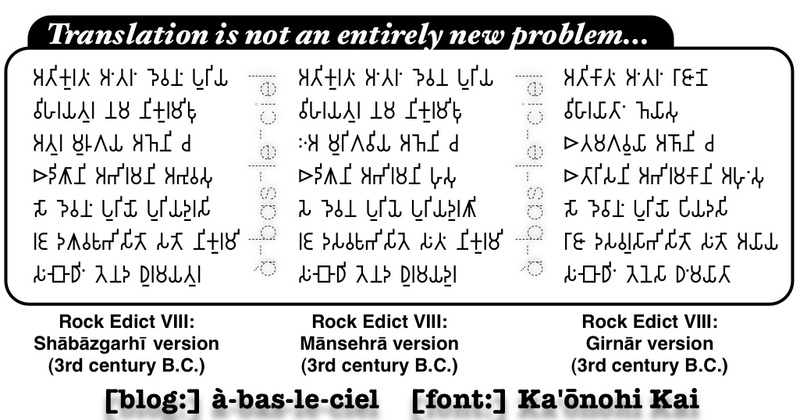 As the operating system became more sophisticated, its ability to deal with "marginal" languages actually decreased, and Aśokan script specifically went from difficult to impossible to deal with. I'm not digressing to explain what the technical difficulties are because (based on my experience) the vast majority of people who aren't already professionally engaged with these problems will be unwilling to read through an explanation of that kind. The general statement of disbelief I receive (when this comes up in conversation) is that a computer that can display Chinese should be able to display anything, i.e., because the brush-strokes of Chinese characters are so complicated (for the human hand and the human eye to deal with); however, the computer does not "see" language in the same way as a person does, nor does it "write" language in the manner of a human hand. It is much more technically complex for software to render a script with combining elements that need to be "drawn" in a slightly different way given the context of other letters surrounding a given glyph (and this is the case for Burmese, literary Sinhalese, etc. ); the number of brushstrokes is irrelevant. (5) Although a few may end up reading this article as their first exposure to the subject, it is more likely that anyone who could end up looking at this page would be asking themselves (instead) how it could possibly be that anything new could be said about the edicts of Aśoka, and (thus) wondering why I would be encouraging anyone to study anew something that has (seemingly) already been studied so many times over. The subject has been exploited from every possible propaganda angle, and it may seem that there's nothing new to be known. My axiom here is that doubt is productive, whereas faith is inductive: the vast majority of those who have published opinions about these stone inscriptions never read them in their original language, and of the few who did, even fewer took the time to read them in their original orthography (i.e., to read the letters as set out on stone, and to become familiar with the ambiguities and distinctions peculiar to the script). There's room for doubt, and, in time, that doubt will prove to be productive. The other sense in which the ancient is ever new is simply that the people studying it are new: it may be that someone, somewhere, has already studied the edicts of Aśoka, but that really doesn't entail that it would be pointless for you (now) to learn to read them for yourself. The point here is not that your reading is better or worse than some other scholar who lived a hundred years ago: the point is that your reading is your own. It is only by the act of such reading that you can develop the ability to do such reading (and this is especially true of a dead language: you can't practice by striking up conversation at the dépanneur). I've never heard anyone say that learning Chinese is pointless because a billion people have done it before, and (perhaps strangely) I've never heard anyone working in English literature say that it's pointless to read Shakespeare, because it has been done so many times before; conversely, I have heard the excuse many (many!) times that there is (supposedly) no point in undertaking original research on ancient Buddhist texts because "someone" supposedly has done this all before. This is a poor excuse, and, even worse, it results in the current generation depriving itself of an education: doing things for yourself is not an embellishment to learning, but is the process of learning as such. If you don't have the patience to sit with a text and copy it out longhand (from manuscript to manuscript) then you don't have the patience to learn the language. I say this while quite aware that the conceit of contemporary education is the very opposite, and that students now are supposed to know things without any process of memorization or application: the substitute for learning is a matter of repeating the opinions of others, and the mannerisms of making learned quotations are the only skills passed on through the medium of the university lecture. What is really necessary for learning has not changed so much since the bronze age. Unfortunately, in the current generation, I have never heard of a student sitting and copying out a manuscript in this manner (neither with a professor nor without one, neither in a PhD program nor in a monastery). The significance of reading the primary source doesn't diminish because "someone" else has done it before, and, of course, there's the separate problem (discussed in many of my more formal publications) of who this "someone" is that people suppose have done all the hard work before, and whose judgements can now be relied upon; to be a scholar of any particular language means relying on nobody's judgement other than your own, and nobody's reading other than your own. There very few rewards to taking this path, however, once you've done the work yourself on the primary sources, you can then look at the secondary sources with new eyes, and perceived (or even "appreciate") the many forms of fakery that dominate the field. Certainly, the propaganda that has been attached to the edicts of Aśoka (by many different nations) becomes absurd as soon as anyone studies the primary source for themselves; and, indeed, many of the grand theories and generalizations made by linguists and historians are also revealed as fakery, from the direct study of the edicts (and they are not the only such instance, but merely the instance of this short article). (6) It deserves to be said, both in conclusion and as a warning, that learning of this kind is neither appreciated nor encouraged in the 21st century: in looking at the illustrations attached to this article (or found in any of my published work) it may be worthwhile to ask yourself when was the last time that you saw any such thing in an academic journal. The lack of interest in comparative reading of primary sources (and demonstrating that they were consulted and transcribed accurately, etc.) is a "false first step" into a hall of mirrors; however, the lack of interest itself is very real. Almost nobody alive has reading comprehension of Pali, and the small number who can muddle through primarily rely on reading it in Romanized phonetics. Nearly nobody can make comparative reading of manuscripts from different parts of Asia, and even closer to zero learn to read the dead language in scripts that are likewise dead. As my simple point was for this article, there remains a question of "why not?"